Translating a website can be a huge undertaking yet truly rewarding in the end. It allows you to reach a wider audience and explore potentially untapped markets, both of which can lead to higher sales and conversions. It can also make your site more user friendly for certain users, especially if you’re already attracting a substantial amount of visitors from a particular region. 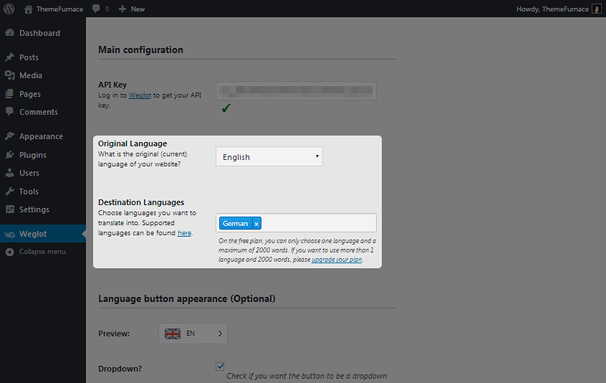 There are a number of different ways to create a multilingual site with WordPress, with a number of different plugins leading the way in terms of popularity. However, these plugins often require you to translate everything manually, creating that “huge undertaking” we mentioned earlier. 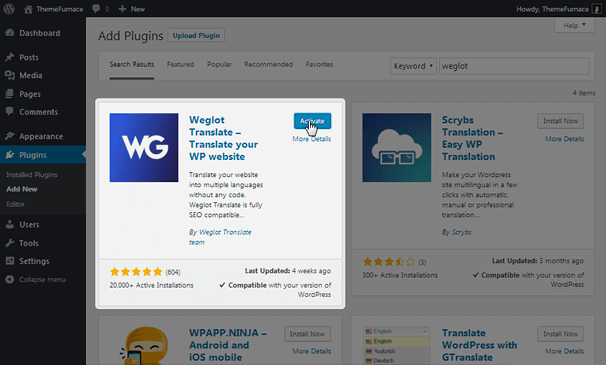 Weglot is a multilingual WordPress plugin with an aim to make translating content in WordPress as simple as possible. 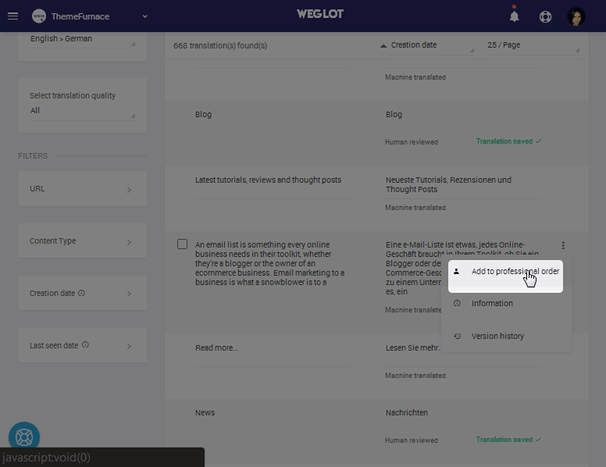 Weglot was originally launched as a brand new multilingual WordPress plugin on February 5, 2016. 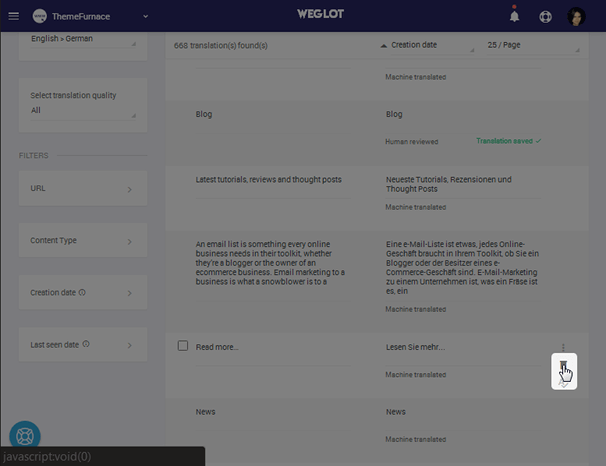 This plugin remains to be the most popular way to use it, but Weglot is an API at heart that also integrates with platforms like BigCommerce, Shopify and Jimdo. It allows you to translate every part of a website with a combination of automatic and manual translations. 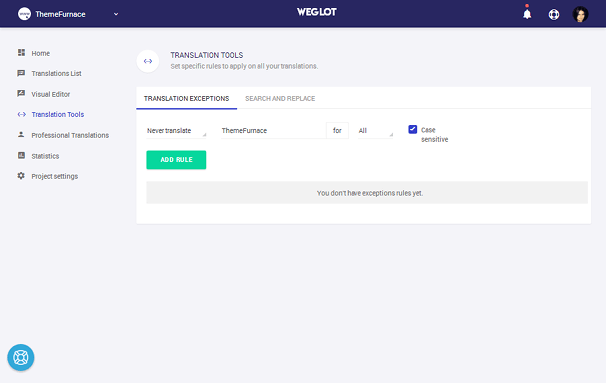 You can add manual translations yourself (we’ll show you how in a bit) or recruit professional translators directly within the Weglot dashboard. Your site can be translated in over 100 different languages. We’ll talk more about the features this plugin offers throughout this how-to review. We’ll also go over the plans it offers. Let’s get into it. 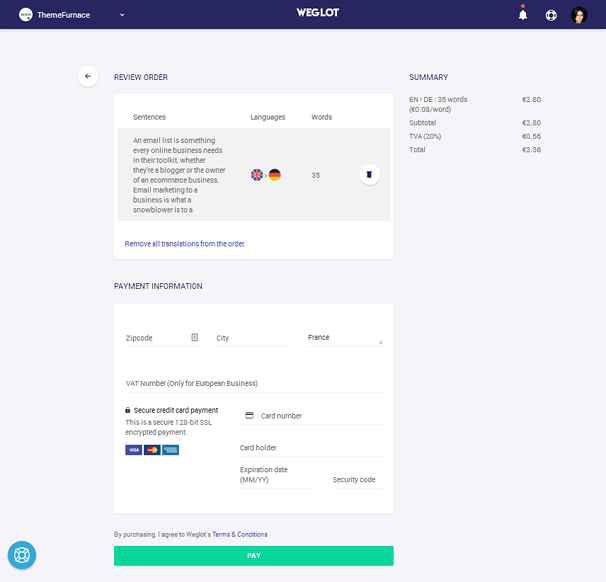 Weglot offers a free plan that allows you to translate up to 2,000 words into one language with a maximum pageview limit of 5,000 views (only translated content is counted). You’ll find the base plugin available right within the WordPress plugin repository because of this. Download it here, or install and activate it from the backend of your WordPress site. You need an API key to connect your site to the service, which means you’ll need to use your email address and desired password to create an account at Weglot.com. 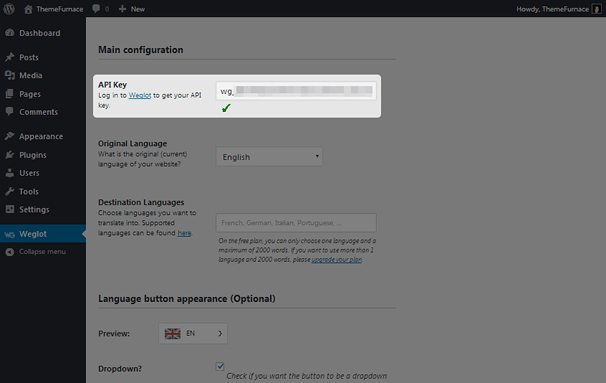 Once you activate your account and sign in for the first time, you’ll be given an API key, which you can copy and paste into the API Key box on the Weglot settings page. 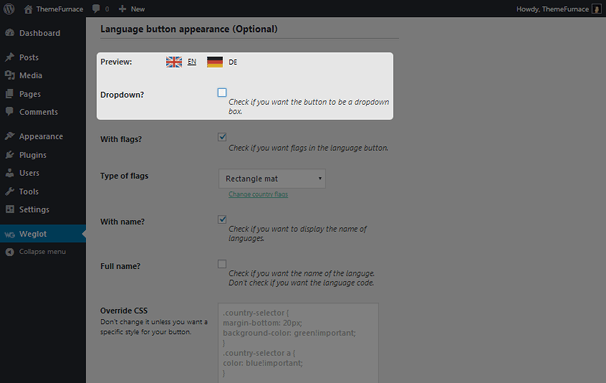 Select the current language your site uses in the Original Language menu if English isn’t it. 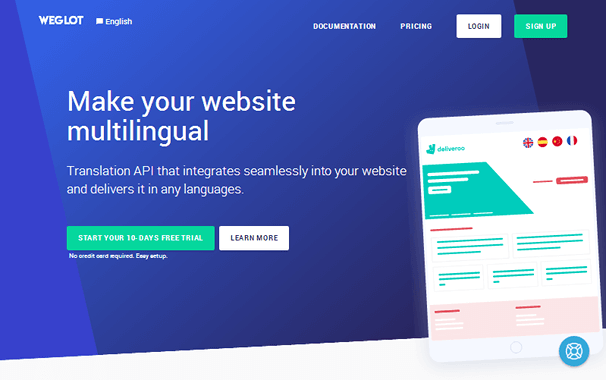 Enter the first language you’d like to translate your site into in the Destination Languages field, and scroll down to the bottom of the page to save your changes. Visit the frontend afterward. You should see a button in the bottom, right-hand corner with your “original language” selected. Open it, and view your site in its translated form. Here’s an example using our very own Louis theme with an English to German translation. Let’s learn how to change this button’s appearance. The default button uses a drop-down menu, but you can change it to an inline style by unchecking the first option in this section. There’s even a handy little preview at the top. The next few options allow you to configure the way the flags appear in the button or whether they appear at all. Configure the “With flags?” and “Type of flags” settings until the flags appear the way you want them to. 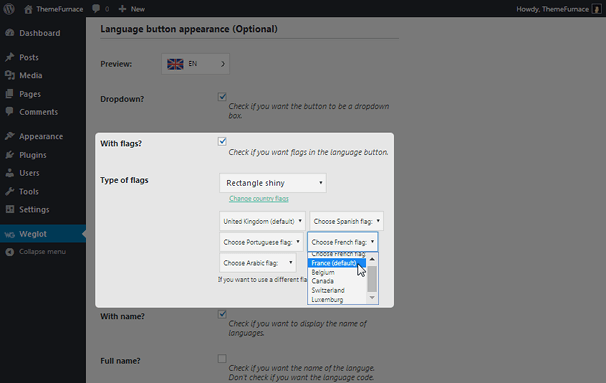 Click the “Change Country Flags” link if you want to change the country associated with a particular language. Use the next two settings to control the way text appears in the button. The last setting, the Override CSS box, can be used by those experienced in CSS. The box contains helpful filler text that tells you which class selectors to use if you want to customize the appearance of the button yourself, such as by changing its colors to suit your brand. Save your changes, and check the frontend of your site to ensure everything is working properly. Scroll down to the next set of settings if so. Use the Language Button Position section to control where the button gets placed. If you select the first option and place it in your navigation menu, it’ll change the button’s menu style to inline if you had drop-down selected. Make sure you change it back if so. It’ll also replace the bottom button. If you have other menus, the button will appear in those as well. You can control which menus display it with a simple CSS rule. Contact the Weglot support team if you need help as this rule may be different from theme to theme. If you want to display the button in a widget area, use the Weglot Translate widget. 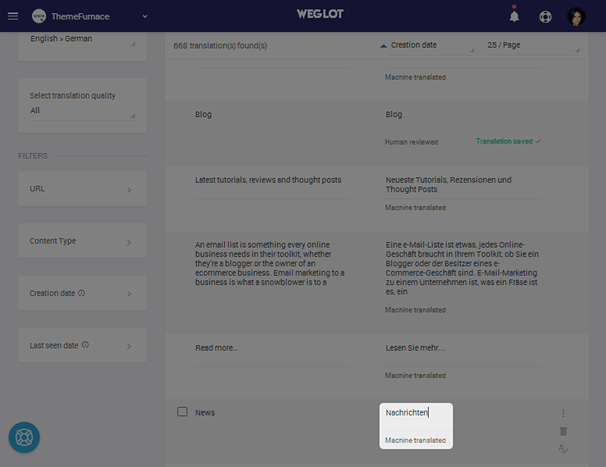 All you need to do is drop it in one of your widget areas and add a title to it (optional). You can even deselect the menu setting so that the button only appears in your sidebar, if you wish. Use the final two methods to place the button wherever you wish. The shortcode allows you to place it in text editors across the backend of your site while the ID selector allows you to place the button anywhere you please in your site’s source code. Let’s move on to the more technical aspects of this plugin. If you don’t want certain parts of your site to be translated, use the Translation Exclusion section to omit them from translations. 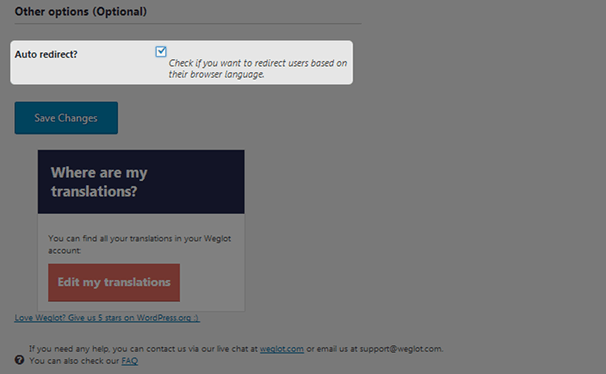 For instance, if you exclude an entire web page from translations, the language button won’t even appear on that page. 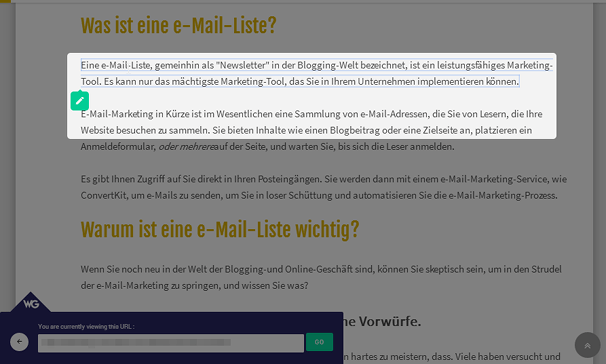 There are two boxes you can use to exclude parts of your site from translations. 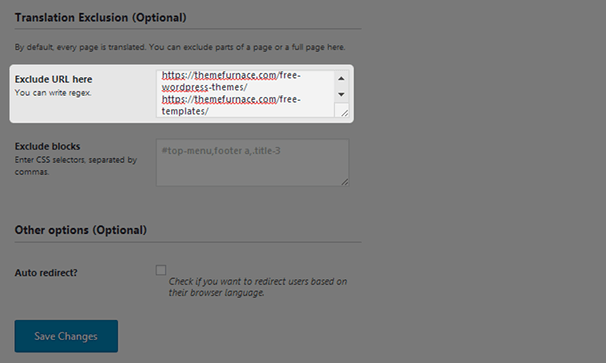 The first allows you to exclude entire pages. All you need to do is add one URL you want to exclude per line. You can also exclude specific elements, such as a menu, from translations by inserting their CSS selectors in the Exclude Blocks box. The language button is a handy little feature visitors can use to change the language of your site to something they’re more familiar with. If you subscribe to any premium plan, which starts at €9.90/month or €99/year, you can turn on the auto redirection feature so visitors are redirected to translated pages automatically based on the language preferences selected in their browsers. Once you have these settings configured, go ahead and click the Edit My Translations button to head to the Weglot dashboard. 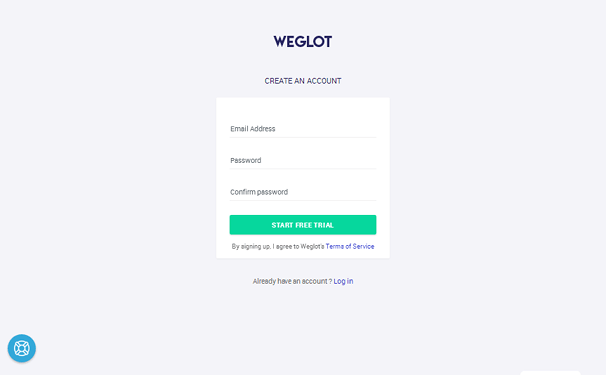 You can also simply sign into your account at Weglot.com. 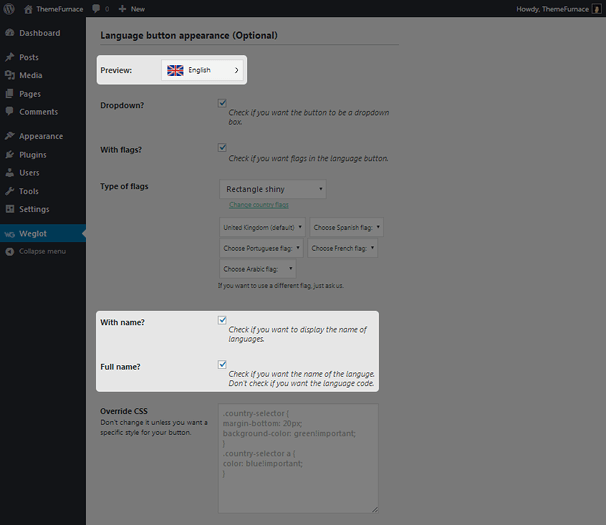 The plugin’s settings page is what you’ll use to connect the service to your site and configure the way the language button appears. 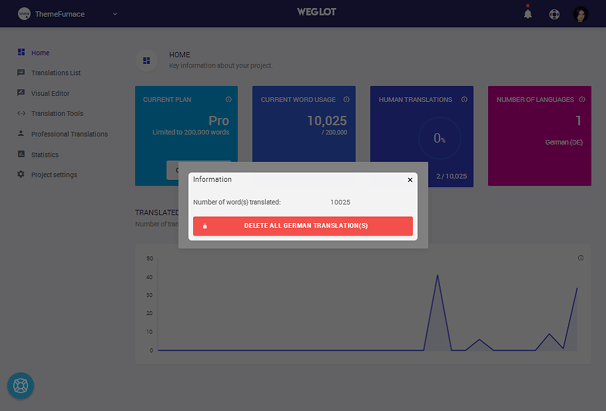 Since translated content is hosted by Weglot themselves, you’ll use the Weglot dashboard to manage it. The plan you’re subscribed to. 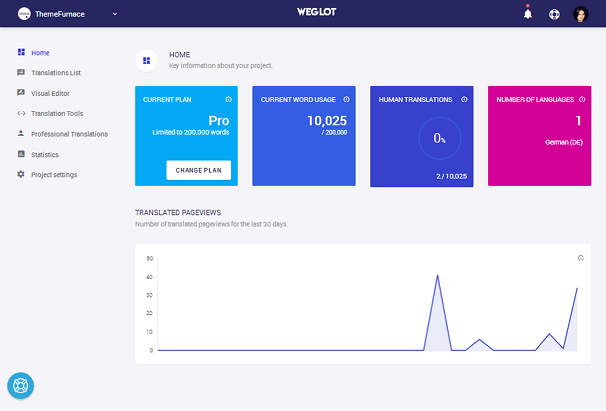 The number of words Weglot has translated for you as well as the number of words you’re allowed to translate in your plan. The number of human (manual) translations you’ve made. The number of languages your site is translated into. The amount of pageviews your translated content has received in the last 30 days. There aren’t many actions you can take from the Home screen, but you can change your current plan or delete an entire language from your site by clicking on it and confirming your choice. Please note, however, that this action cannot be reversed. Any human translations you’ve made will be lost forever. Let’s go over the other sections this dashboard has to offer. The Translations List provides the easiest way for you to manage translated content on your site. 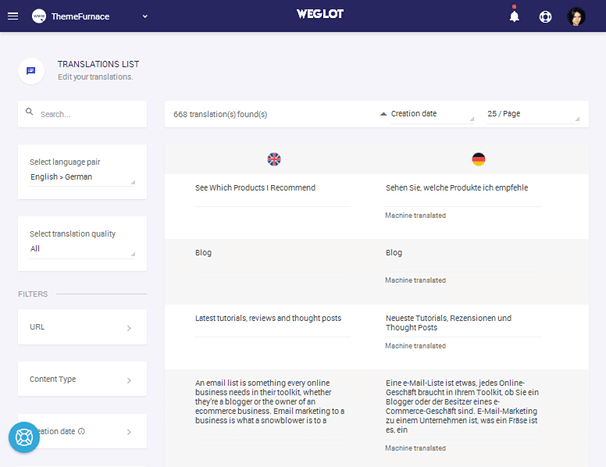 It contains a complete list of every bit of content Weglot has translated for you. It even breaks larger pieces of text, such as blog posts, into smaller chunks. All you need to do is go down the list and use one or two of these actions depending on the circumstances. If you know a translation is correct, click Mark as Reviewed to confirm it’s completion. If you want to delete an item from this list, you can do so temporarily by clicking the Delete button. However, it’ll reappear in this list the next time you refresh the page. You’ll need to exclude it from translations if you want to delete it from your site entirely. More on that in a bit. If you’re familiar with the language you’re translating your site into and notice an error, click on it to edit it directly from this page. The change will appear on your website immediately. If you are not familiar with the language and need help translating a few of these items (or a lot), click on the menu icon, and select Add to Professional Order. 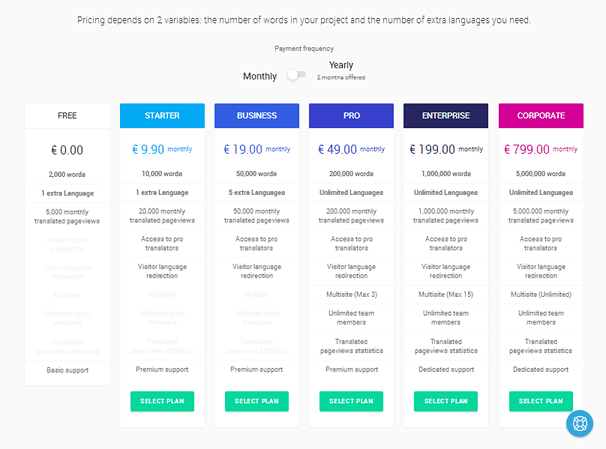 Premium plans come with access to the services of professional translators at a starting rate of €0.08/word. When you “Add to Professional Order,” the item gets added to your shopping cart where you can view a summary of your order. If you don’t want to edit translations from this list, you can edit them on the frontend of your site using the Visual Editor. All you need to do is launch the editor, navigate to a translated page on your site, and click on individual pieces to edit. There are two tools you can use that allow you to control which content gets translated on your site and fix corrections in bulk. 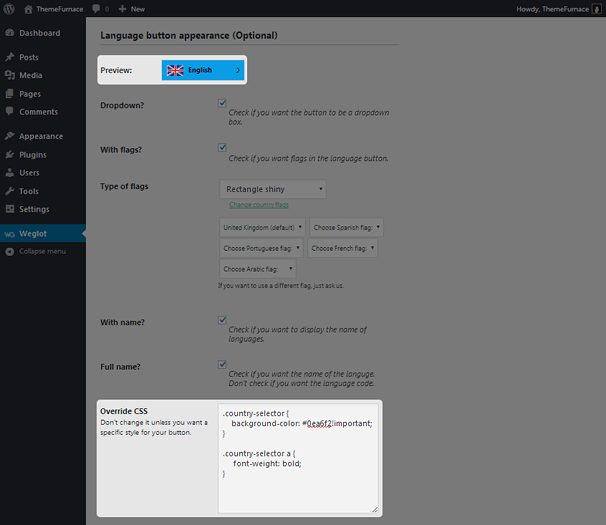 For example, if you don’t want your company/blog name to be translated nor any brands you mention, use the Translation Exceptions tool. You can also use this tool to force translations. If a certain word or phrase you didn’t want translated winds up being translated, use the Search and Replace tool to correct every instance of that word or phrase in one go. You can also use it to correct a particular word or phrase that keeps being translated incorrectly. If you subscribe to the Pro plan or higher, you can invite an unlimited number of members to your team to help with translations. These additional team members can be assigned roles. Your role will always be “Owner,” but any additional team member you add can be a “Manager” or “Translator.” Everyone can perform translations, but only you can delete projects. Meanwhile, only you and managers can manage team members. To add team members, go to the Project Settings section, and fill in the field there. That’s pretty much it on how to configure and use this plugin. Let’s talk pricing. Please note, this review was written in March 2018, so it may not reflect Weglot’s current pricing model. There’s one free plan and five premium plans. Plans are available in monthly and annual formats with two free months offered on annual plans. The plan you choose will most likely be dependent on the number of words or number of languages you need to translate your site into. You’ll do fine with the free plan if you have a small website and only need to translate your site into one language. You can translate up to 10,000 words with the first premium plan and as many as 5 million words if you go all the way up to the Corporate plan. Since Weglot does host translated content for you, it restricts the amount of pageviews you’re allowed based on the plan you choose. However, it does not count your original content, so this shouldn’t be an issue. Support starts with basic email support available in the free plan. If you subscribe to the Starter, Business or Pro plans, you’ll have access to live chat in addition to priority email support. Weglot accommodates Enterprise and Corporate customers with dedicated account managers. 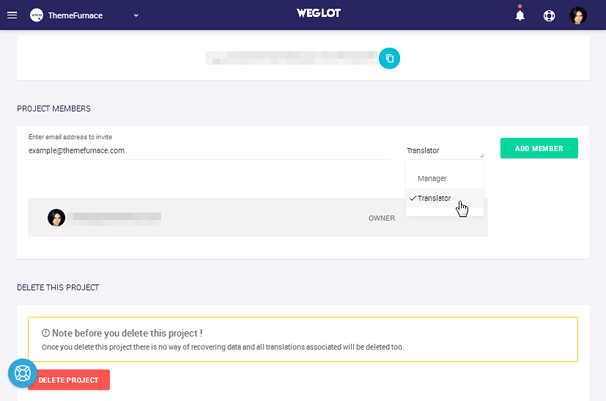 Weglot offers a fantastic solution if you’re undertaking a large translation project on a WordPress site. 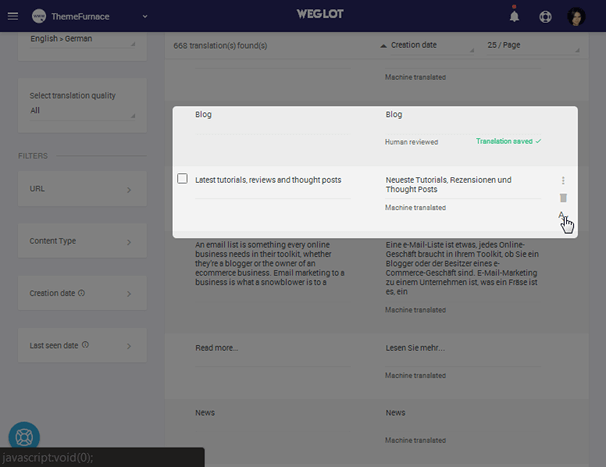 It simplifies the process by allowing you to translate your entire site automatically and clean it up by editing smaller bits and pieces manually. It’s easy to use, as demonstrated throughout this review, and even easier to get started. Download the plugin and create a free account today to give it a try. Ahh, you have explained everything so well, even a non-technician like me can implement the basic changes with this great guide. Thanks for sharing. Hi, thanks for thorough review of Weglot. 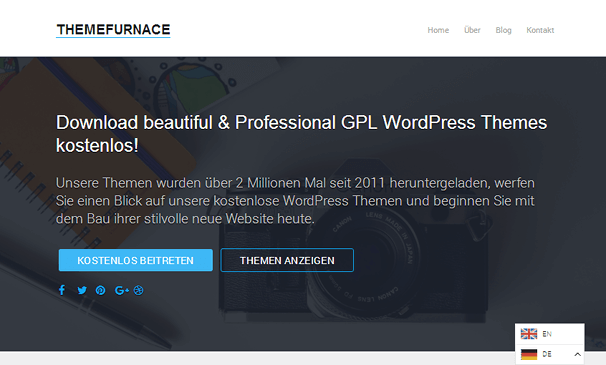 It is indeed a great WP plugin. Will it work as a href language tag? We saw in Google Webmaster tool, International targeting section? Like always, great content, Keep up the good work! I have found this site on Google Search. I would like use these services for my sites. I need only see the correct pack. A brilliant guide from you that helped me to use and understand the whole WordPress Language translation game. Hey, It’s a really great post. Worth reading this. I am looking forward to more post like this as these are a great source of information on the latest advancements in WordPress. Thanks for sharing this amazing and wonderful plugin. You have really explained very well about configuration of Weglot. Thanks for sharing this brilliant guide. You have really explained very well about the Welgot. Such a wonderful post. Very well explain about welgot. wow, you explain all these things too easily bro thank you for this have a great day. sir, I want to know if anyone from another country then my website will automatically translate into there region country language? The translation of websites into the several languages is optimal for attracting more potential customers. The browsing of pages will be much faster. Thanks for sharing this information.It’s really good. Our tool is completely spam-free, and there are plenty of amazing features to help you out here. We can provide you comments too, but you won’t find lots of comment that are copied. Our every comment is unique and work differently. Good job, keep postiing such articles..